While you’re all busy with the Guess the Mystery Player challenge, we’d like to introduce you to a new section on the FunGoPlay blog called FLASHBACK FRIDAY! Every Friday, we’ll highlight a famous player or team and give you some fun facts. 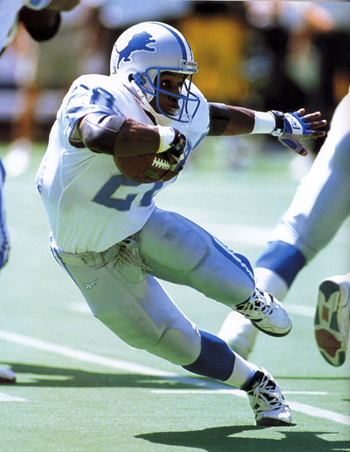 In the spirit of the recent NFL craze we’re going to start off by taking a look at Barry Sanders! Barry Sanders is one of the best running backs to ever play the game of football, staying with the Detroit Lions for all of his career! From 1989-1998, Sanders dominated the field with lightning fast speed, impossible strength and a small body size that made him very tough to tackle! Sanders is the third-leading rusher of All-Time in the NFL, was a Heisman trophy winner in college and holds 10 Detroit Lions team records – plus many another awards. We’ll put it this way… the guy was a BEAST! What do you think of Barry Sanders? Who do you think we should feature for Flashback Friday? Tell us on the FunGoPlay Forums! Posted by fungoplay on August 5, 2011 in Sports and tagged barry sanders, flashback friday, fungoplay, history, sports.